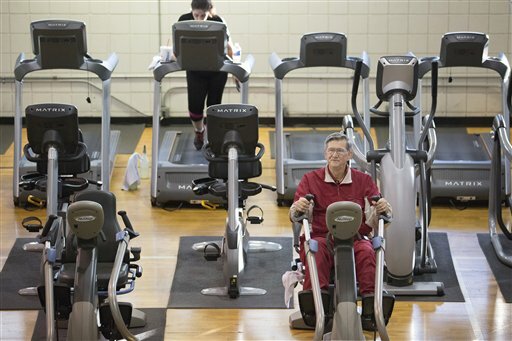 Glendon Bassett does a cardio workout at the Family YMCA in Hot Springs, Ark. Whether it’s coverage for end-of-life counseling or an experimental payment scheme for common surgeries, Medicare in 2016 is undergoing some of the biggest changes in its 50 years. Grandma’s Medicare usually just paid the bills as they came in. Today, the nation’s flagship health-care program is seeking better ways to balance cost, quality and access. So far, the 2016 change getting the most attention is that Medicare will pay clinicians to counsel patients about options for care at the end of life. The voluntary counseling would have been authorized earlier by President Barack Obama’s health care law but for the outcry fanned by former Republican vice presidential candidate Sarah Palin, who charged it would lead to “death panels.” Hastily dropped from the law, the personalized counseling has been rehabilitated through Medicare rules. But experts who watch Medicare as the standards-setter for the health system are looking elsewhere in the program. They’re paying attention to Medicare’s attempts to remake the way medical care is delivered to patients, by fostering teamwork among clinicians, emphasizing timely preventive services and paying close attention to patients’ transitions between hospital and home. Primary care doctors, the gatekeepers of health care, are the focus of much of Medicare’s effort. Patrick Conway, Medicare’s chief medical officer, says that nearly 8 million beneficiaries — about 20 percent of those in traditional Medicare — are now in “Accountable Care Organizations.” ACOs are recently introduced networks of doctors and hospitals that strive to deliver better quality care at lower cost. “Five years ago there was minimal incentive to coordinate care,” said Conway. “Physicians wanted to do well for their patients, but the financial incentives were completely aligned with volume.” Under the ACO model, clinical networks get part of their reimbursement for meeting quality or cost targets. The jury’s still out on their long-term impact. Still, a major expansion is planned for 2016, and beneficiaries for the first time will be able to pick an ACO. Currently they can opt out if they don’t like it. SAMA is part of Medicare’s Comprehensive Primary Care Initiative, an experiment in seven regions of the country that involves nearly 400,000 beneficiaries and a much larger number of patients with other types of insurance. The insurers pay primary care practices a monthly fee for care coordination, and the practices also have the opportunity to share in any savings to Medicare. He thought about the emergency room, but he got in right away to see the nurse practitioner working with Dr. Gary Bevill, his longtime physician. The nurse fetched other clinicians to look at Bassett’s swollen right leg. He was immediately given antibiotics. And the doctor referred him to a cardiologist for an outpatient procedure that has since improved his circulation. “If I hadn’t seen the nurse practitioner when I did, I feel like I would have been in the hospital,” he said. Bassett has since moved to Hot Springs, in another part of the state, but stays in touch. Joint replacements are the most common surgical procedure for Medicare beneficiaries. Starting in April, hospitals in 67 metro areas and communities will be responsible for managing the total cost of hip and knee replacements. The experiment covers a 90-day window from the initial doctor’s visit, through surgery and rehabilitation. At stake for the hospitals are potential financial rewards and penalties. Medicare’s goal is to improve quality while lowering cost. But hospitals worry about financial consequences and advocates for patients say there’s a potential to skimp on care. “What we are discovering with all this change is that trying to get to value over volume is very difficult to do,” said Herb Kuhn, who heads the Missouri Hospital Association. Patients choosing Medicare’s hospice benefit at the end of their lives have traditionally had to give up most curative care. Under Medicare’s new Care Choices model, patients with a terminal illness will be able to receive hospice services without giving up treatment. A cancer patient could continue to get chemo, for example.